I am intrigued by the suctioning method and am considering purchasing the items needed to perform this procedure. I just have a few questions. Is there a difference between subcision-suctioning and needle-suctioning? I've seen the subcision term thrown around a lot but I don't know if there's a difference between the two. I needled a few acne scars in the past with diabetic lancets and have seen some minor improvement. I haven't needled in over a year but I am looking to try it again to hopefully improve the appearance of these scars some more. It sounds like I would just needle the scars as I usually do then use that suction item you sell every day after for a week then every other day for the second week, correct? What is the typical downtime associated with this? And by downtime I mean how long will I be carrying a very unsightly mark or bruise on my face. When I just needled, I believe I just had to steer clear of the public for a few days until the scabs came off then there was some redness for a week or two. What type of scars is the suctioning most useful for? What other products should I purchase to use in conjunction with this method? The subcision method is usually performed by a doctor. It requires freezing of the skin and they sometimes have to go quite deep if there are a lot of tethers. I had this done by a doctor and he used a hyperdermic needle to perform the procedure. They go in horizontally and basically wiggle the needle back and forth so that the sharp edge can cut the tethers underneath the skin. Some scars are really deeply tethered so in order to see success with the dermarolling/ stamping this might have to be done first. I noticed a big improvement in the lifting of the skin when this was done. And now I use the dermastamp every four weeks to fill in the rest of the skin. I've also started suctioning every couple of days. The right diet is also important for new collagen to form. Plenty of protein, zinc, Vit C, are necessary for good healing. Hollow, knife shaped needles such as diabetic lancets are totally unsuitable for microneedling. What's wrong with the diabetic lancets? I was using the BD ultra fine 33 gauge lancets. I have definitely seen improvement from this. How are the needles you sell different/better? Oh that sounds pretty intense. My scars aren't too deep so I probably won't go the subcision route. I'll just needle them. 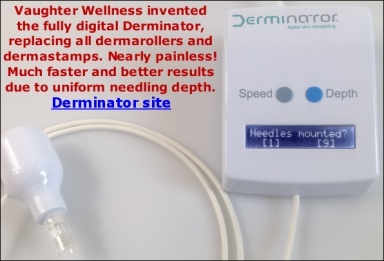 Is the dermastamp better than single needling do you think? After you suction, how does your skin look and for how long? I'm trying to get a good idea of how much time ill have to spend hiding from the public after this. Yeah I get a ton of protein and take zinc and vitamin c every day. Oh ok that makes sense. I guess I'll purchase the single needles you sell as well as the suction thing. What else (if anything) do I need in terms of the essentials? Oh wow you suction each scar 8-10 times? Thanks for the heads up, I'll try to be careful. Ok and what products do I need? And when would I apply them? Acne scars. Specifically a shallow box scar (I think), a small rolling or box scar on the nose, a small line indented scar on my forehead and maybe some little ones on the nose. I have needled them all before using those diabetic lancets like I said earlier. But I haven't done so in over a year. Their appearance has improved a bit since then but the progress has seemed to come to a standstill. I was looking to try it again this time using the needles you sell which you say are better so hopefully I'll get even better results. I'm in college so I'll probably wait and do it during spring break because of the likely scabs and redness I'll be dealing with. I'm still debating whether or not I should suction as well. I am intrigued by it but I don't want to deal with prolonged redness and such that would last past my spring break. So I don't need copper peptides or vitamin c?